Monday was out first long hike of the season. As I have said before, when hiking with your dog you have to start small and then go big. You can’t lead a sedentary life, or only walk a mile or two a week, and decide to go climb a big mountain tomorrow. Both you and your dog have to be properly conditioned for that kind of hiking. 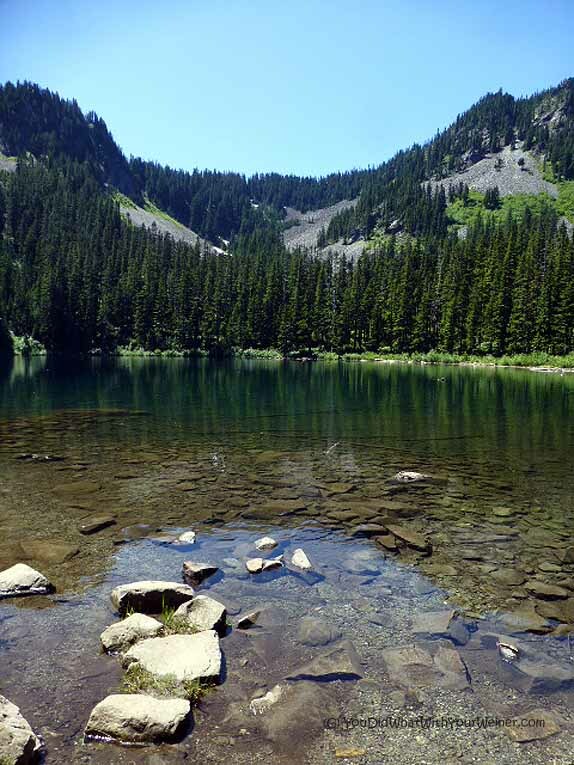 Yesterday we hiked 7.5 miles to Annette Lake. For most small dogs, that would take a long time to work up to, if they could ever do it. Chester and Gretel have been hiking for years and I know they are capable of that distance (not much more in a day though). 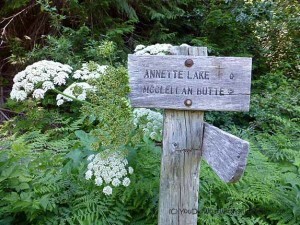 They completed a couple hikes last year that were this long and, in fact, steeper than the Lake Annette trail. We have been hiking for a couple of months this year to build back up to that distance. If you are going to tackle 8 miles with your dog, this is a good first-trail to do it on. It was certainly an uphill climb but pretty moderate as Western Washington trails go. There were enough flat-ish stretches to give you a quick break. There were also plenty of places along the trail to stop and take a break. We saw 5 groups of people at the top at least 3 of them had dogs with them. The lake was beautiful but I was glad I remembered my bug spray this time….although the bugs didn’t listen much. I hear the lake is shallow enough that it is pleasant to swim in by the middle of summer. I didn’t see anyone fishing but we did see trout jumping and even saw a small one swimming by the log we had lunch on. It was a great workout, a beautiful spot and I can’t wait for our next hike. Check out Chester’s hiking style. He is always such a happy boy. That looks awesome and I bet a little dip in the lake would be super refreshing for the dogs! Chester doesn’t like water much. No matter because the trail was dusty and I preferred to now have little mudballs when we got back to the car 🙂 Gretel dis wade out a few inches when I was out standing on a rock. Great trail & hike. Chester is an athlete – look at him go! It’s pretty cute I gotta say. He probably doesn’t like being called cute, but he is. We love reading about your adventures! The pictures are wonderful! Good for dog – good for you! Beautiful lake! A swim would have been nice. Beautiful hike! I’m always so impressed with little dogs (and their owners) who are conditioned for serious hiking! How gorgeous was that hike?! Gizmo heard Chester jingling and woofed to say Hi! We have hiked that distance and more, but without the elevation it is a lot easier for us. I have to wonder how the climb would affect the distance we could comfortably do. That’s funny that Gizmo woofed. Yes, elevation makes all the difference. If the trail was relatively flat I am sure Chester and Gretel could hike 15 miles or more. In fact, Chester DID hike 15 miles before IN THE MOUNTAINS. That was in his younger years though. Wow! That lake is gorgeous and it looks cool and refreshing. 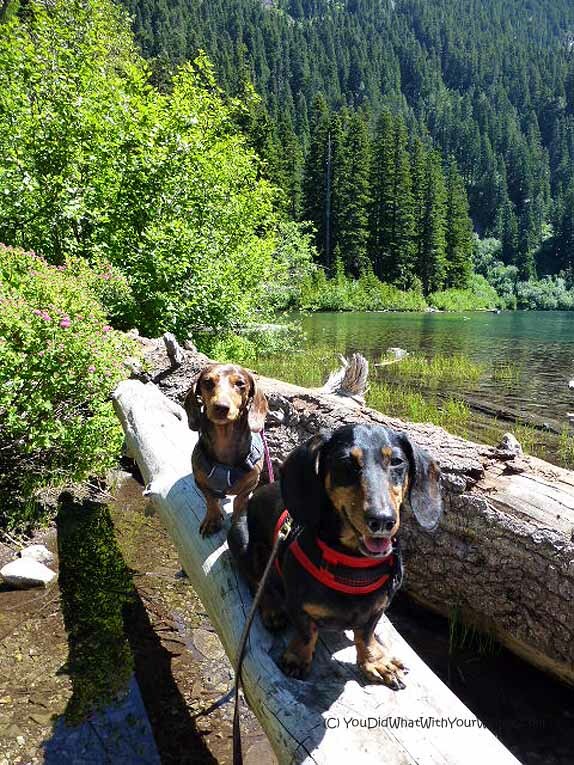 I love dogs on logs… great photo! Most of the adult Doxies I’ve seen have been chubby to obese. How great that you get your little guys out to exercise their little legs. They look so healthy and happy. Great hike you guys! I love how hiking doxies bounce around like bunnies. Wow sounds and looks fabulous. Thanks for sharing. Have a great weekend from Talent Hounds. Isn’t it cool how many hikers have dogs with them? I’m so impressed with the athleticism of your little dogs! What a beautiful place! It really makes me miss hiking. We used to hike a lot, but haven’t for years now. I’d really like to get back into it, but we’d have to work up to it for sure. 7.5 miles sounds like a long hike to me, I don’t remember doing too many that were that long. Goodness, Chester really trucks right along! He looks like he is having so much fun. Thanks for letting me know that, Jessica! I had actually seen the giveaway on Facebook and meant to come back to it, but I had forgotten. What a great giveaway too! I downloaded Best Hikes with Dogs Western Washington, 2nd Edition to my Kindle and will be going through it. Thanks for letting me know this existed. I had no idea it was updated so often. Cool! What a fun hike! Beautiful scenery and cute pups! I like hikes where there are places to “pull over” and rest and enjoy the scenery. Thanks for sharing! Beautiful pics. And…I think I might have to marry Chester! Wow!! Look at the view!! Very stunning. You two are lucky dogs, not many dogs (and human) can see such beauty. The more we share our pictures and stories the luckier I feel. I have always known we live in a very beautiful place but kind of took it for granted because I grew up here. After hearing what it is like where some other people live, I feel very lucky for the mild weather and amazing mountains. Oh, that looks lovely! Rita loves to take a dig when we go hiking. She gets overheated if we go on hikes in the summer where there’s no water.